Contract farming is a much-needed vehicle to bring new crops, technologies, and markets to farmers. However, the new model Act 2018 opens up agricultural markets to contracting agencies without adequate safeguards for farmers. The first attempt at reforms in agricultural markets was made by the union government with the design of a model Agricultural Produce Market Committee (APMC) Act in 2003 which provided for new market channels for farmers and buyers, ie direct purchase, private wholesale markets, and contract farming (CF) were made legal. In the 15 years since, the union Ministry of Agriculture and Farmer Welfare (MoAFW) has been struggling to get the Act accepted at the state level, but only some states have adopted it fully, some only partially and a few are not even looking at it (eg UP). Now, the MoAFW has come up with another model Act — the Agricultural Produce and Livestock Marketing (Promotion and Facilitation) Act 2017. It has also decided to separate CF from the APMC domain, citing conflict of interest which is not letting the CF practice to spread as traders and commission agents in APMC markets oppose it due to their business getting adversely affected as the contracted produce does not have to come to the APMC mandi and does not need to pass through the mandi agents. Therefore, taking a cue from Punjab which had in 2013 instead of amending the APMC Act, enacted a separate Act on CF (unnecessary and not operationalised even today), the MoAFW has floated a model Contract Farming and Services (Promotion and Facilitation) Act, 2018 (APLCFSA, 2018). This model also mentions that one of the benefits of keeping CF and services out of the purview of the APMC would be that the buyers would not need to pay the market fee and commission charges, resulting in a saving of 5-10 per cent of their transaction costs. It remains to be seen how many states would adhere to the new Act. Punjab would have to amend its 2013 Act. The 2018 model Act retains the 2003 model Act provision which protects the ownership right of the farmer on land as the sponsor is not allowed to construct any structures on it. 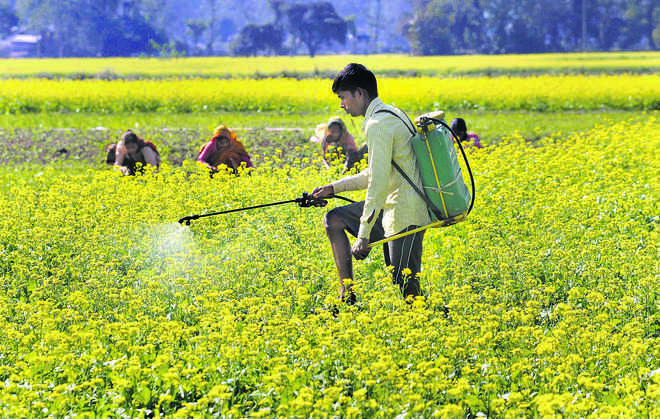 It also makes crop insurance a part of the CF arrangement which was much needed to reduce farmer's production risk in the absence of any other mechanism, especially when high-value crops are more prone to risk. But, its goodness ends there. The APLCFSA, 2018 bids goodbye to regulation as an objective. The 2003 model Act had mandatory and optional provisions of CF (contract farming). This suggests that it is left to the parties to the contract to decide on all aspects of the agreement. On the other hand, the Act states that the sponsor shall have to make arrangements for purchase and provide materials for filling and weighing/measuring of the produce, in advance when the produce is to be taken by the producer for delivery to the sponsor at the agreed place. When other terms have been left for the two parties to agree on, why these are mandated, it is not clear. Similarly, the Act specifies terms of payment through electronic clearance: two-third of the value of bought produce to be paid at the time of delivery and the rest after quality assessment (QA). If QA is pending, how can the buyer pay for the produce? That the committee has gone overboard in facilitating CF for the benefit of private agencies as against the farmer interest comes through the provision for the producer leasing out agricultural land to the sponsor-lessee for CF under this Act, not inconsistent with state's the law. How can a committee mandated to legislate on CF step into the domain of land leasing when a separate model land leasing Act is proposed by the Niti Aayog and when there are state laws on land lease? This would allow sponsors full access to farm land, not just through CF, and would encourage disguised corporate farming practice. For the first time, under the model Act, CF (Promotion and Facilitation) Board is seen as a guide and umpire, which would popularise crops under CF in domestic and export markets as a brand of contract farmed produce. It is difficult to see how a regulatory body can engage in promotion of this mechanism when its primary role should be conflict resolution and monitoring of CF projects. It is not desirable. Why should a state-funded body promote markets for private agencies? The CFS Board fund is created under the Act with 0.3 per cent of value of contracted produce charged as facilitation fee from CF sponsor which is capped at 0.5 per cent of the value of contracted produce. This fee can be waived initially to promote CF as an incentive. This is bringing back market fee in another form, though the argument was that the CF agencies need not pay the market fee as they do not use mandi facilities. More surprisingly, the Act links contract price to market price which is the anti-thesis of CF philosoph. If the agency has to go by market prices which may not be efficiently discovered, then why should it go for CF? Haryana, under its amended APMC Act had linked the contract price to the MSP and that was seen as an undesirable step as contract price cannot be tied to any other price mandatorily as the costs and yields can also be grounds for farmers to get into contract farming, not just price. The model APLCFS Act uses the concept of family farms which is not relevant in the Indian context as if 86 per cent farms are marginal or small (less than 2 hacs) and have been producing commercially, how can they be compared with family farms in the USA or Europe where the proportion of such farms is much smaller though their average farm size is larger? The Act gives operational inefficiency of small (‘handkerchief size') farms as the reason for promoting CF. It is difficult to understand how the scale of farm operation can change due to CF as the only way to achieve some semblance of scale under CF is to have group contracts which the Act does not even mention. That group contracts are already in practice in India in Gujarat in crops like potato has been conveniently ignored. In the statement of objects and reasons, it states 'the singular guiding factor that informed the committee in formulating this law has been protecting and promoting the interests (land owners, higher productivity, reduced cost, higher price returns) of the farmers, in general, and small and marginal farmers, in particular'. This sounds like a lip service as it is not carried through into the Act which does not even mention group contracts as a mechanism to protect the interests of individual small producers and give them the needed bargaining power. Thus, the model APLCFS Act opens up agricultural markets to contracting agencies without adequate safeguards for farmers. It has been prepared in a hurry without much debate and would not serve the purpose of making CF efficient and inclusive. That is rather unfortunate as CF is a much-needed vehicle to bring new crops, technologies, and markets to farmers.